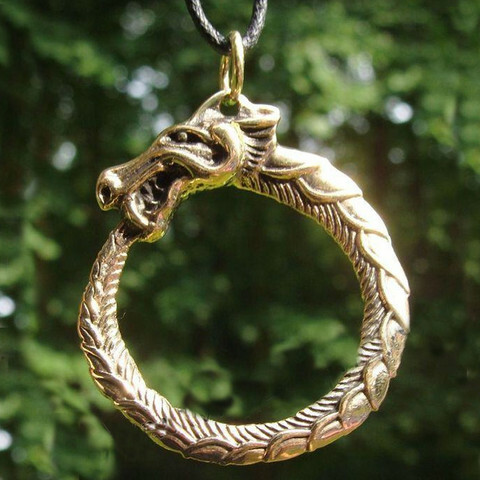 Jörmungandr, Bronze Pendant Snake from Midgard. Jörmungandr or Midgardsormr is also a sea serpent. He was born to Loki and Angrboda along with the wolf Fenrir and the woman Hel. He is supposed to represent a threat to the AEsir and humankind. For this reason, Odin intervened and threw him into the sea. In the marine waters, he grew to a size so large, that he surrounds Midgard (he is also called Midgard Serpent) and bites his own tail. Size: 3.5 cm. Material: bronze.